Some opportunities might come around year after year, or you might find yourself doing a similar job to one you've done previously. Clone an opportunity to create a copy of it. There's a few ways you can clone an opportunity. From the main Opportunities screen, click the clone icon to the right of the opportunity in the list. Anywhere you see this icon, you can clone. 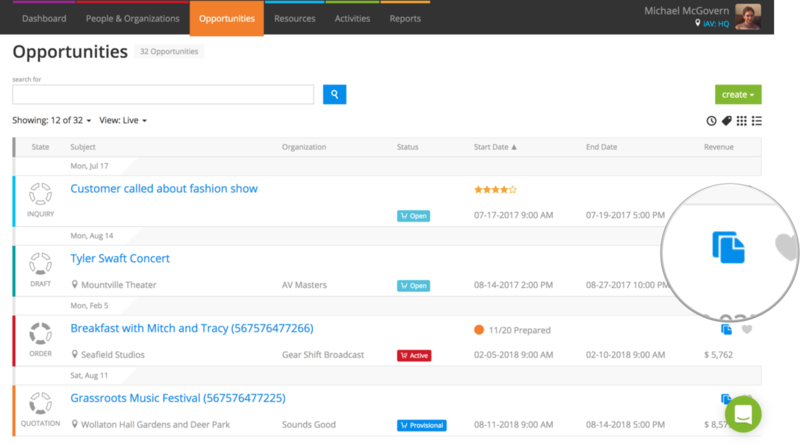 For example, you can clone opportunities from an organization or venue page in People & Organizations. From an opportunity page, choose Clone opportunity under Actions to clone an opportunity. When you clone, all of the key information from the opportunity is copied over. Discussions, attachments, and costs are not cloned. Cloned opportunities are created as drafts, so no stock is reserved and no opportunity number is generated. From your draft, work with your opportunity as normal: edit to change the organization, venue, subject, or other details; add or remove products and services, change prices, and offer discounts; and convert to quotation or order.